1. These shoes are a slightly less trendy take on a "cage sandal" that I might actually be able to pull off. 2. Loving the emerald green color and tiered effect of this silky top. Does this model remind anyone else of Emma Stone?? 3. OBSESSED with this lace top. Even though it looks like it sold out in the last 24 hours (since I saved this image), I had to include it anyways because it's just so pretty. Ann, are you listening? Bring this top back! 4. I would need to be about 500 shades tanner to pull this top off, but I love it nonetheless. Great shape, great material, bad color for pale blondes like me. 6. And this one. Such a flattering shape/neckline. And love the thick ribbing at the bottom. 7. YES to these pants. I think I am going to have to bite the bullet on these. 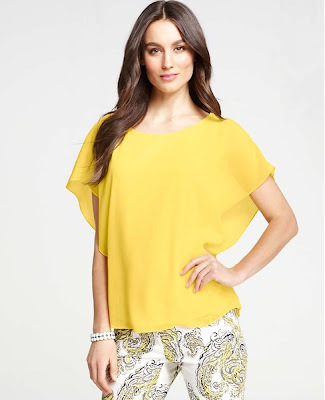 Love the cropped length and the possibly stretchy waistband. 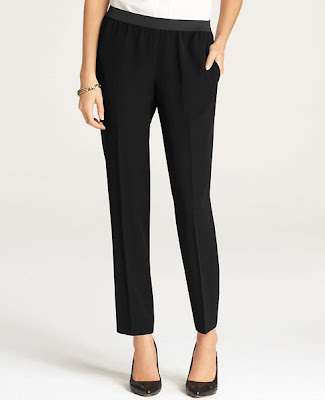 Pants with stretchy waistbands that are dressy enough to wear to work are nothing short of magic. 9. 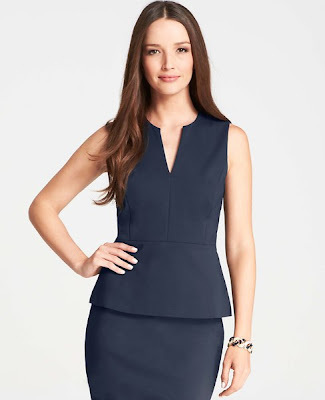 Another understated peplum that I would pair with the number 7 pants for work or some skinny dark jeans for play. 10. So pretty! Really wanting this one in black. Grr. 11. And last but not least, one more lacy number. Apparently lace is trendy? I like. That's all for today, folks - PEACE! Dogs Who Are Excited to Be DOGS!